The idea for this blog post came to me when I was surfing the internet looking for second hand car. I was looking at a couple of used car directories. I thought to myself “Where else can I find cheap used cars?” And then a “light bulb” flashes on my head, why not look at car auctions! That’s what I did. I started looking for information about used car auction on the internet. Initially my thoughts were to get a car maybe 2 or 3 years old for myself. And then it dawned on me, the same car can also be used for electric vehicle (EV) conversion! As you may have already known, you need a donor car for your Do It Yourself (DIY) electric car conversion project. If you are looking for cheap electric donor car, why not go to used car auctions. The more I think about it, the more excited I become! There are many advantages of getting a donor car from auctions compared to a used car dealer. Firstly, the cars from auctions are generally in better condition. Some of the vehicles are pretty new but the owner has to give it up because he is unable to service the loan. As far as we know, the used car dealers may have gotten the vehicles from car auctions themselves and selling it for a profit. From my research, here’s what I found. Some organizations have no choice but to get rid of surplus cars on their books. This is especially true for some US government departments. But here’s the problem, there are so many states in the country with hundreds of car auction going on every day. How would we know which one to choose? Here’s what I found. There is actually a web site that gathers all the government vehicle auctions information on one central database. The web site is Gov-Auctions.org. The first time I saw this web site, I was really existed. The government is trying to get rid of cars at auctions. This means you have the potential to get dirt cheap vehicle as an electric donor car! Here’s the catch. 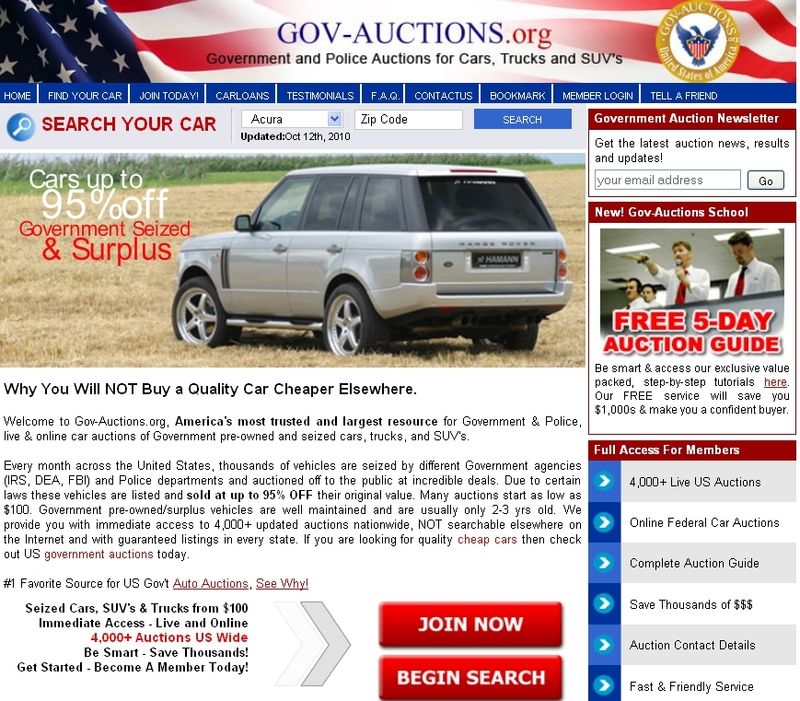 The government car auction site is not a free service. You have to pay them a fee to access their database of all the auction sites. Nonetheless, the fee is very minor. Just imagine if you were to find a great deal at the auction, the money saved would have been more than enough to cover your investment. Check out the screen shot below on some of the cars up for auction. I don’t know about you, but I am really excited about this! I have never done any bidding at car auctions before. It is a good place to learn. I will do more research on this. If you are in the process of searching for cheap electric donor vehicle for EV conversion, check out Gov-Auctions.org. the cars from auctions are generally in better condition. Some of the vehicles are pretty new but the owner has to give it up because he is unable to service the loan. I am very lucky to participate this discussion. I have no such idea about auction. Recently, I purchased an e-book of Government Auction Handbook. There are easy steps which is very important for everyone. After that I am very comfortable about auction.